- Good graphics, sometimes great, nice explosions, good draw distance., solid smooth framerate. - Things blow up nicely. Highly destructible environments/structures but not quite everything is destructible. - I finished the single player campaign. The length felt just about right. I actually found myself enjoying the story, cut scenes, and characters quite a lot. It's not the best writing in the world but I found a lot of it quite funny and likable. - Controls take a bit getting use to. I don't think they have the mouse look acceleration/ auto aim feel quite right. Turning down the sensitivity helped quite a bit but something about it feels a little off. - This is a highly accessible shooter. You can stick your self with a needle to heal every few seconds as many times as you want. If you do happen to die then you just re spawn nearby to continue the fight (nothing resets). Still, as lenient of a system this is, I still found the battles quite exciting. This is one shooter with zero frustration. - Nice set of weapons. I really like some of the special weapons you find throughout the game like the artillery strike and air strike. Guns sound and feel powerful. - The vehicle sections aren't bad but I still prefer the foot parts. - I tried the Gold Rush multilplayer for a few hours (Conquest mode is a free download). It's ok. I've played BF 1942 quite a bit, a tiny bit of Vietnam, some BF2, and some 2142. This has the same nice squad spawn aspects that BF2 introduced. 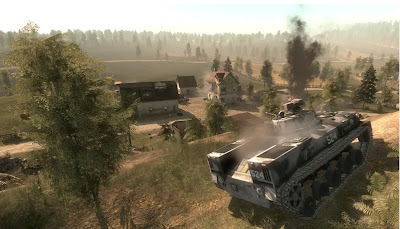 What I've kind of grown tired with the multiplayer BF2 scene is the constant spawn camping and unbalanced vehicles (which just depends on luck or more camping to get said vehicle). The spawn camping is made worse because firing doesn't reveal you on the map. You have to be spotted by a sniper or something before a red blip shows up. 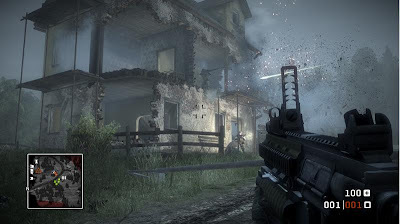 This game really needs a death came like in COD4. For those of you who like BF style multiplayer, then Bad Company should appeal to you. For me I prefer COD4 or Halo 3. Recommended. I enjoyed the single player, and I think the game is good enough to stand alone on just the single player campaign. Add the multiplayer and (especially if you are into that style of gaming) this is one pretty complete package.